Providing team tennis for all abilities. Team Captain details can be found in the downloads section or contact Reception and we will pass your details on. Sheffield and District League, the Club has 3 Men’s, 3 Ladies, 2 Mixed and 3 ladies late summer teams. We also compete in the Rowlinson Cup. Click here to view Sheffield and District fixtures, rules and league information. 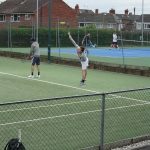 In the Chesterfield and District summer league the club has 2 Men’s, 2 Ladies and 2 Mixed teams and in the Winter the club has 2 Mixed teams. The club also takes part in the Derby area Lawson Wood Cup. The Club has junior teams in the Sheffield and District League and in the Derby League for players under 8 up to under 16. The club host junior tournaments for mini red, mini orange and mini green players. Please see useful downloads for current details of junior leagues and tournaments. The club has a Welfare Officer. Barbara Langen. If you have any concerns or questions regarding safeguarding at the Club please ask at reception or ring the Club on 01246 238798. We have a dedicated secure email if you wish to contact our welfare officer. Monday evenings 6:00 pm - 9:00pm Summer only.